Description: The Club's mile and half of the Crystal lies directly upstream of the historic Red Stone Inn. 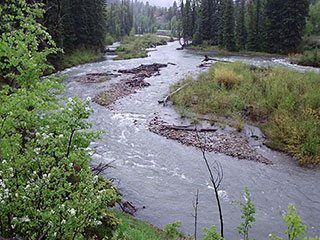 The river here is 40-60 feet wide, containing brown, brooks, cutthroat, and many rainbows. Situated along the Crysal River and Kline Creek is a home belong to one of the landowner's that is available to Club members. Click on the VRBO link and enter Property ID# 296073 for additional information. Location: This property is located 18 miles south of Carbondale in Redstone.